As mentioned elsewhere on this site replicas of MSDS/GS models abound but seldom do they have the signature items which can only be found fitted to the genuine article. 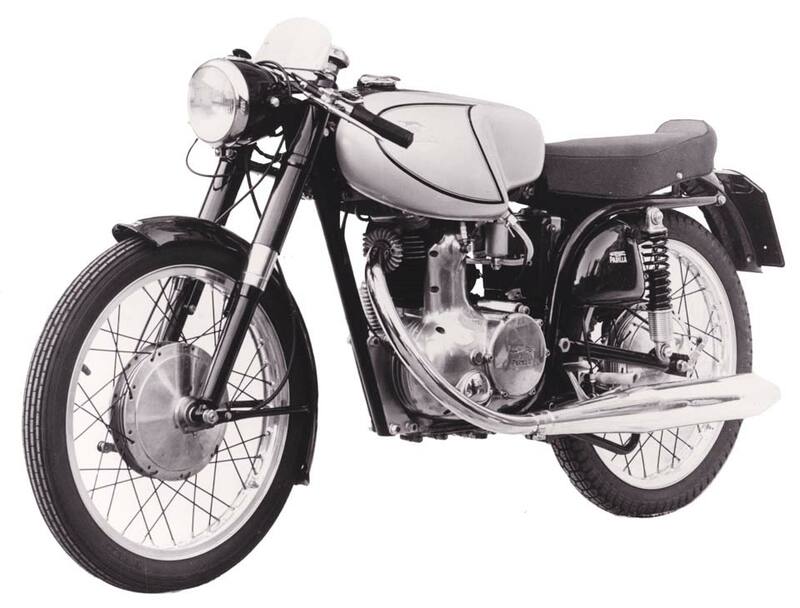 Depending on the year of the MSDS/GS the cycle parts which relate solely to that model may be the frame,tank, clip-ons & many other items on a ’56/57 MSDS – to the seat, foot controls & silencer on a “Tourist” framed machine of ’58 on. Late MSDS/GS bikes shared parts with other 175 models such as the 175SS so it can be relatively easy to replicate an MSDS/GS from the base of say a 175SS or a 250 Tourist with a little more effort. Looking for the parts listed below may be a useful indication of what variant you are looking at but without confirmation of the correct series number on engine & frame you may be looking at a replica using some genuine “signature” components. There is no guarantee that reproductions of these parts will never be made but some are so difficult to replicate exactly that it would be commercially impossible to justify their reproduction….until MSDS/GS values increase further of course! 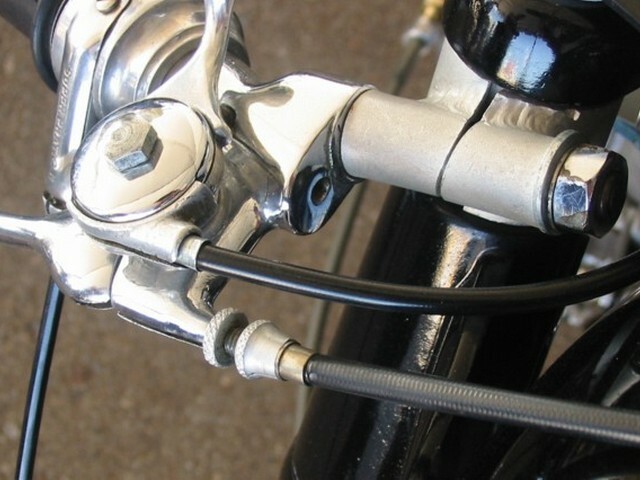 Clip on handlebars – two types of bar were fitted. Both fit below a plain steel top yoke with no drillings for handlebar clamps as fitted to the touring models. The type fitted to the last frame (Tourist style) are typical Italian bars with welded on lever perches & dagger-like levers with or without ball ends. The clamp around the fork leg is pressed steel with two bolt locations formed into it . The killer touch is the Moto Parilla text & dog logo stamped into the front face of the clamp. 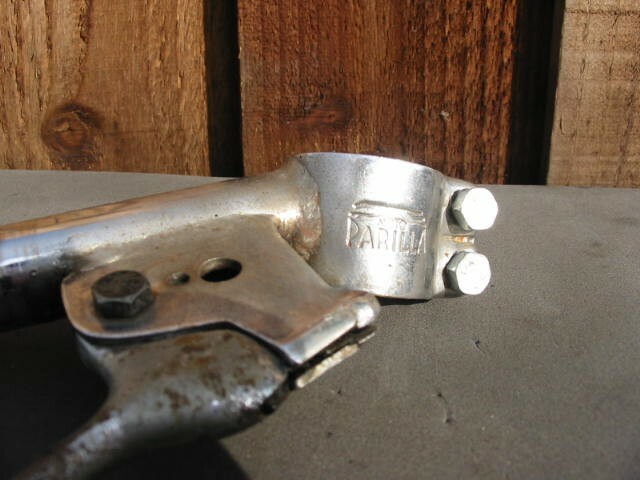 Replicas have been made but the clamps & logo are quite difficult to create exactly as OE.Earlier type 2-piece clip on shown with the clamp around the fork leg fixed with the threaded end of the handlebar itself – no Parilla logo.The late type clipons show an all-aluminium choke lever ; the early type has a chrome steel cover. 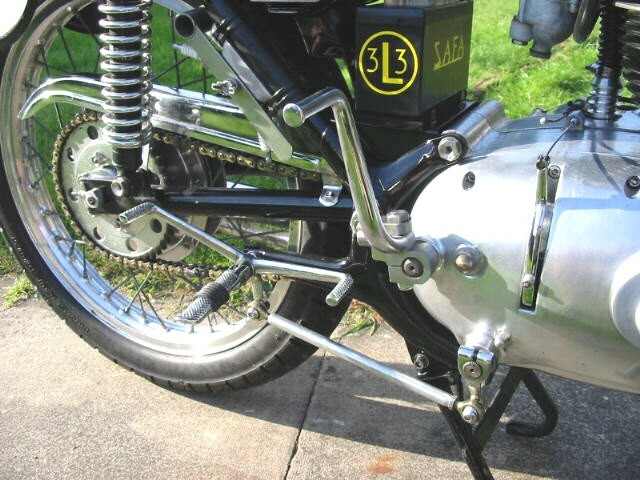 Rearset footrests – Different frame types have differing designs. I will deal first with the type I have owned – the later “Tourist” framed version.These rearsets must be the heaviest ever made with cast steel footrests, gearlever & brake pedal. The gearlever is the notorious “heel and toe” which neither the heel nor the toe seem to be suited to operating. 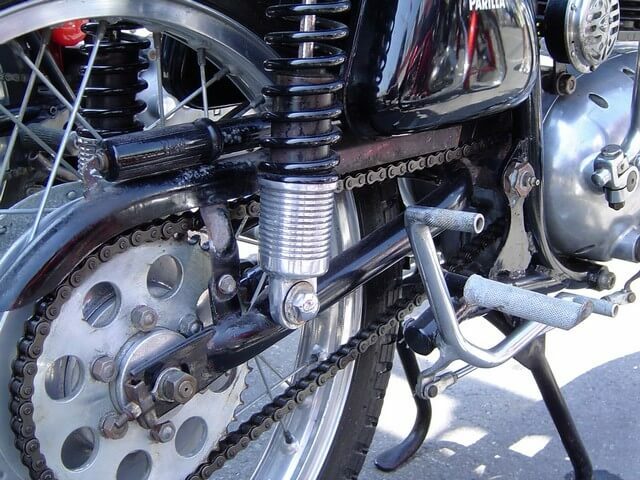 Don’t look too closely at the pic for many items – such as the shocks & gear linkage – are non original. 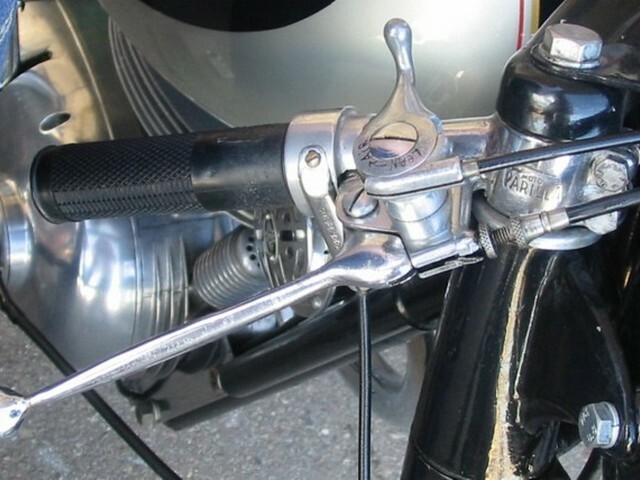 The MSDS was set up to be used in the Motogiro D’Italia in this picture.These controls are very difficult to replicate successfully as the dimensions are such that an alloy or bronze replica casting would not be strong enough. Only a steel casting will do (SG iron to be exact). I have had some cast in steel in the UK but after finishing & chroming was completed they were horrendously expensive & not something I’d do again. 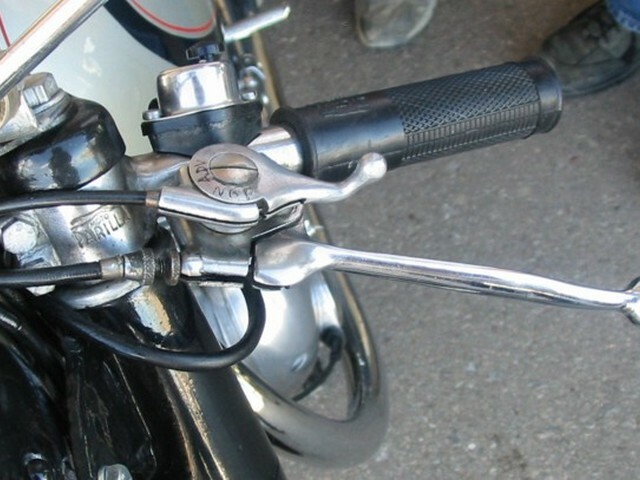 The 1957/8 MSDS 175 used the tubular steel frame of the earlier Sport Competizione and similar foot controls. The rests were tubular steel constructions as was the “heel and toe” gear change. The brake pedal was a steel casting. I have seen reproductions of these components in Italy. 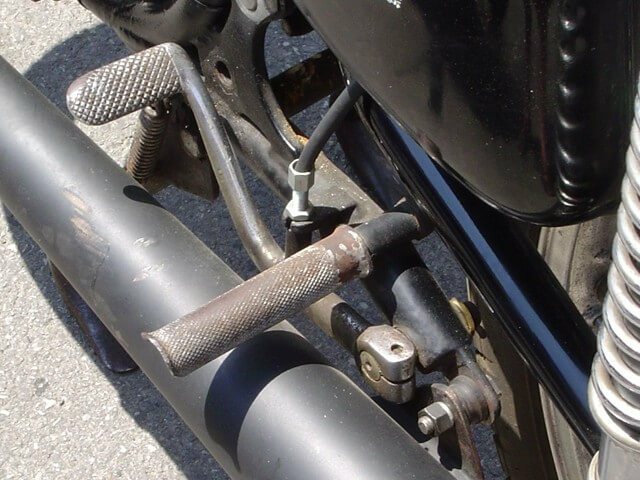 Silencer – Despite all the pictures showing “straight piped” MSDS machines most were supplied with a huge cigar shaped silencer which seemed most out of place on a sports bike. All frame types used the same body shape with different brackets fitted. 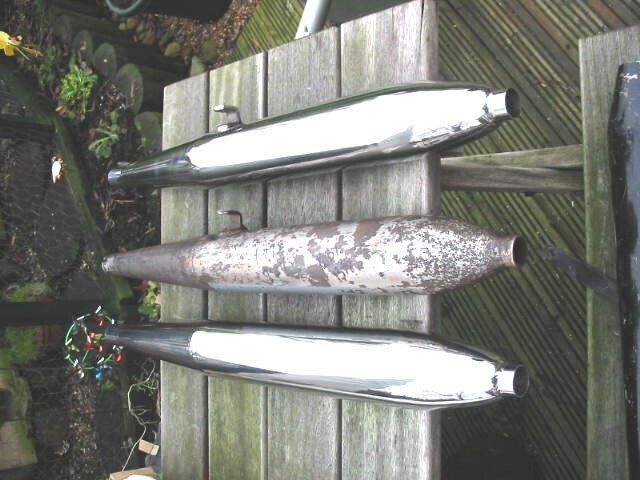 The centre silencer is a genuine unit fitted to a mid 50s MSDS, the ones either side are replicas made here in the UK in stainless steel. The similarly shaped “cigar” on the standard road bikes is 26″ long, the MSDS version is 32″. 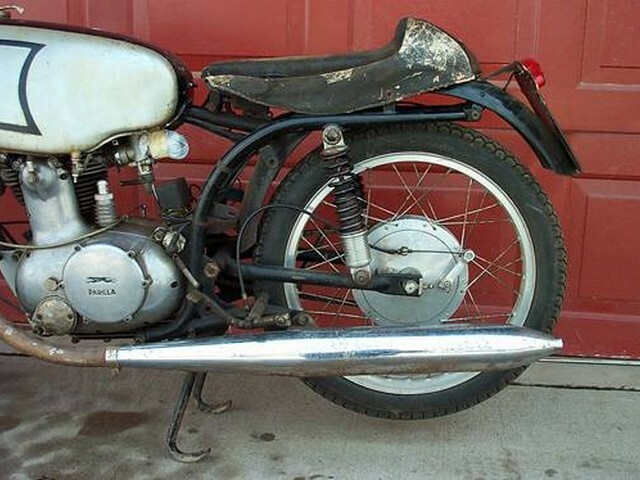 A very original looking GS in the USA with the huge silencer in place.Note also the original (& very heavy) race seat.